Books I have written. See book list. It was a dark and stormy night. It was dark all right but the storm had sort of passed. It was one of those “You had to have been there” experiences. I’m glad you weren’t. I was able to count out 20 bad conditions and decisions, including one leaving me and the bike a little damaged. The biggest thing was that I made it, alive, and even that I had gotten strong enough in the past two weeks of biking to be even be able to do it. It all started with the biggest storm in California in 10 years. Streets were flooded in San Francisco and power was out for thousands. Further south, where I was, got hit less but still seriously. Rock and mud slides off the fire-denuded hills inundated out communities and, apparently, a section of CA Highway 1, The Pacific Coast Highway, that I had used a few days earlier going north. I was on my way back south to San Diego. I departed Port Hueneme that day at 11:00 a.m. after waiting out the morning rain. My goal was Malibu and Santa Monica and I figured the 48 miles shouldn’t be a problem. Even when going around a closed highway barrier at Highway 1, I hoped I could still go that way even if it required some walking and carrying. Road crews were cleaning up mud that had slid off the hillside. onto the road. One of the truck drivers told me the road ahead was closed and, in his words, I’d get arrested if I went on. So, bike and me, decorated in mud (no fenders on my Bike Friday), turned back and took the around- and over-the-mountains route to Camarillo, Simi Valley, the San Fernando Valley, and Topanga Pass. The entire ride was one of worry. I didn’t know how long this would take and exactly how far it would be, but sure it would be a lot more than 48 miles. That and the early darkness of mid-December. With these concerns, I made a lightning-fast food stop at a McDonalds in Camarillo with 21 miles done and made no other food stops the rest of the 75-mile day. The stretch between Camarillo and the climb to Simi Valley I had done in 1993 with Ralph Boething and family on the LA Wheelman Double Century. I didn’t remember much of it except the climb was unrelenting but nothing special. I had with me, luckily, the marked-up Ventura County map Ralph had given me back then. The descent into Simi Valley was no problem but the climb out the east end was typical mountain riding, Santa Susanna Pass at 1,568 ft. Descending was winding, fast, and I worried about possible mud on the road from all the rain. I took it slow. Crossing the San Fernando Valley on Topanga Canyon Blvd was in heavy traffic as I didn’t want to take the time to seek quieter streets. I was aiming to get to the big climb at 4:00, thinking wrongly as it turned out, I could make it over and down the pass before dark. I was only a minute late to this goal but the climb to 1,560 ft took longer than anticipated including dealing with another flat (I had a lot this trip, more on this later). It was dark by the time I was rolling down and to add to the excitement, my light was fading. I’d switched to blinking mode to save what juice my batteries had. The oncoming traffic was heavy, probably more than usual because of the closed coastal road. It was blinding me and I was still concerned that the wildly winding road could have wet muddy spots. At least the car headlights were helping me see the road surface. I was descending carefully and so slowly that I was concerned about cars coming up behind me. The 8 or so miles took what felt like an eternity and I was relieved to reach the coast, just a few miles out of Santa Monica. A relief but it wasn’t over yet. I biked to the Santa Monica Pier on the bike path which was almost indistinguishable from the beach itself because of all the sand from the rain. After checking into the 2nd St. Hostel at 6:00 p.m., I “celebrated” with a slice of NY pizza from Joe’s around the corner, contemplating the day’s 75 miles, and what I could or should have done differently, one example being a quick stop for new batteries and maybe a snack. I had a lot, unusual for me. The first was the 6th on the road with 390 miles and it was the most frustrating. This was the most challenging day of this tour up to then. I’d biked along the coast from Santa Barbara to Gaviota with no problems. Then I had a 3-mile climb north on Highway 101, including a highway tunnel, to where Highway 1 takes off west toward Lompoc. The map showed I’d have to climb about 1,000 ft but didn’t show the gale force headwinds. As I had to do on other steep and long climbs, like last August’s coast ride from Oregon to San Francisco, I needed a catch-my-breath break about every half mile. I was scheduled for an angiogram when I got home because of an irregularity in my EKG during a stress test. My cardiologist warned that I shouldn’t exert myself too hard and my body had been apparently saying the same thing. Anyway, after the bad Highway 101 stretch, the rest of the climb on Highway 1 was steep but not as head windy and I was soon rolling downgrade towards Lompoc. That is, until I noticed a squashy rear tire. I pumped it up and resumed riding but it quickly got squishy again. I took off the rear wheel, looked unsuccessfully for a puncture, pulled out the spare tube, pumped that up, and watched it quickly deflate. The spare tube was bad and not fixable. I looked again for the puncture in the original tube but with no luck. Thinking I might have to hitch a ride, I put the “punctured” tube back in, pumped it up and pedaled furiously while constantly looking down at it for when it would be too soft to ride. That 8 miles to Lompoc was awful and I checked into the first motel I came to. 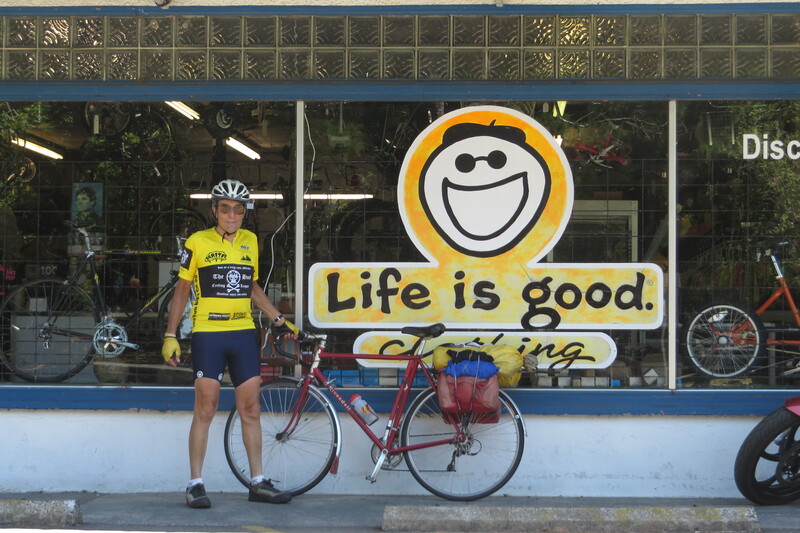 I then looked up bike shops, picked up 2 new tubes, and put one in. I had flats on that wheel every day including the memorable one on top of Topanga Pass. I looked for puncture weed, imbedded glass (there was a lot of glass on the highway shoulders this tour), and fixed tube holes when I was able to find a sink that could be stoppered up. The holes, as it tuned out, were tiny slits. That was a clue. Five days of flats and I finally figured it out – it was the rim’s spoke holes. I had used strapping tape over them. But the fibers only run one way with that kind of tape. The tubes were pushing through between them. I fixed the problem, finally, with duct tape cut into strips. By then, I was on foot in Huntington Beach looking for a bike shop for legitimate rim strips but the duct tape from a CVS store was an effective alternative. No more flats! The tour plan was to fly into San Diego and bike the coastal route north to Santa Monica and back. I’d spend extra days riding in the two cities. This is the same basic formula of 2005, ‘06. ‘10, and ‘13 always done as November (or December) tours plus one in 2009 as a spring tour and attendence at a bike-builder’s show. This time was in December. After nearly no biking in November in Minnesota, I made this as long a trip as I could, 19 days in all. My plan this time was to go north past Santa Monica and as far as Moro Bay if possible. Rainy weather reduced my northern extent to Lompoc. With more predicted rain, I wanted extra days for the return trip. I didn’t need those days and so I had five in San Diego to ride the many places around there: Mission Beach and Bay, Ocean Beach, the San Diego Riverside paths, Mission Hills trails, 30 miles of the AC Southern Tier cross-country route, the Coronado-Imperial Beach loop, etc. Mostly things went as usual and expected. I stayed at the convenient and nice Point Loma HI hostel in San Diego, the HI Hostel on 2nd St. in Santa Monica, a kind of strange non-Hi hostel in Santa Barbara where I shoehorned my bike into the tiny room. Although I had my folding bike, it’s not easy to fold up and I didn’t consider doing that. I also never did figure out how to get the fitted sheets onto the mattress. I also had some nice motels including the rustic Pine Knot in Newport Beach that I’ve used every trip and going both ways. I found most towns have through streets with separated bike lanes enabling me to safely cross town for after-dark dinners and other tasks like looking for new tubes and a tire. Getting My annual 10,000 miles. Previous tours were in November, not December, From the biking viewpoint, it would have made my life much easier this time. November was nice in San Diego and bad in Minnesota. December was the reverse, warmer in Minnesota than November had been. I failed to not do 10,000 annual miles last in 1995 but this year looked like a possibility. November was exceptionally low-mileage and by December 1, I needed 1,044 more. That looked feasible with 18 riding days in CA. The first two days, however, totaled only the 3 miles from the airport to the hostel because of rain. California needs the rain but I didn’t. Then a series of low-mileage days (50, 25 and 40, more rain) left me almost 200 miles short with two days left. (I was assuming there would be no biking in Minnesota upon return on the 20th because of my scheduled medical procedure, the holidays, and the typical December weather there.) It sounds absurd and compulsive to worry about this goal but somehow, it is important to me. I am obsessive about keeping stats and It means I still have “what it takes” at age 73 (in a month) and in short biking-season Minnesota. Well, I did it. My last two days were 82 and 101 miles. Three more to the airport left me just 3 short. I planned to do them at home regardless of the conditions, as it tuned out, slushy streets. Books About Bicycling is now in the 21st Century. More stories and news will follow.